The challenge of building ‘cost effective, great schools at pace’ was set by the Education Funding Agency and the James Review in 2010 to address the limited availability for investment in an ageing school estate. However, how to achieve this without compromising on design integrity or build quality was a concern within the industry. Here Sam Stevens explores the challenge set, and reviews the Optimum Schools Concept – an alternative approach to the governments’ baseline design guidance, devised by Scott Brownrigg, in conjunction with Galliford Try. In 2010 the incoming government abolished the principal schools capital investment programme in England – Building Schools for the Future (BSF) and the Primary Capital Programme. They were concerned by the inefficiencies in the process of designing a school, particularly at a time when the economic environment was in turmoil. However, there was acceptance that continued investment would still be required to deal with an ageing school estate, pressures on school places (particularly with rising birth rates), the need to continually improve education standards across the country, and the need for schools to evolve and adapt in line with changes in the workplace and wider society. In 2011 Galliford Try published ‘The Optimum Primary School – an education-led response to primary school design in a new economic and policy context’. It examined this context and provided the initial research into the Optimum School approach and the processes that were to follow. As the construction industry was being challenged to rethink the way schools were designed and constructed, the first obvious step was to challenge, refresh and confirm contemporary understandings of good education. As a starting point and to respond to school place shortage priorities, primary schools were the most pressing consideration. Unlike most projects, we knew the answer from the start. If we were to be successful in building Optimum Schools throughout the country they would need to meet, or improve on the requirements of the government funding envelope which targeted building for around £1,300 sq m. To put this figure into perspective, BSF schools were normally built for in excess of £2,000 sq m.
With every site unique, government funding needed to be based on a number of standard assumptions; these would then have the price of abnormals or extras added to the overall cost. It was important to Scott Brownrigg and Galliford Try to not only address the cost and efficiency element but also to safeguard the design integrity and quality of construction of each of the school building projects moving forward. In achieving the same high standard, whilst saving one third of the cost, it was evident that a fundamental rethinking of the design and construction process would be required. In addressing the quality of both design and procurement, the following needed to be embedded into the process. Whilst the building form will need to change from project-to-project, its simplicity is essential in striving for an elegant solution. It was felt that a simple form would lead to simplicity of construction, maximising opportunities for repetition and therefore making the most of the limited funding available. At an initial stage we designed the form to echo a child’s view of what a house might look like. Using a building with a pitched roof would provide the flexibility to accommodate the different site locations; it could easily be changed to look contemporary or more traditional to reflect its surrounding context. In addition using a familiar building form might help young children get through the sometimes daunting experience of starting school. Symmetrical in shape, it is familiar, functional and has the opportunity for some exciting spaces under a pitched roof form. With each site unique, and each school possessing its own teaching methods, it was not appropriate for the model to be aimed at a ‘one size fits all’ solution, however we did appreciate that there would be considerable benefits in adopting a solution which involved a significant amount of repetition. Whilst acknowledging that there can be a vast array of different type spaces within a school, in stripping it back to its fundamentals – it is a building, manufactured with a list of parts. Doors, windows, walls etc. each serve a similar function in all schools. So in creating a solution that addresses the cost implications, we questioned the need to entirely reinvent the list of parts for each project. The motor industry embraces this idea particularly well. Companies such as The Volkswagen Audi Group produce a large assortment of cars aimed at different consumers in different markets, yet they can do this efficiently by using some of the same parts across their ranges. This means that a significant proportion of the parts which make up a Volkswagen, an Audi, a Seat, a Skoda or even a Lamborghini are exactly the same. This strategy for repetition within the Optimum Schools model has therefore become known as a ‘Kit of Parts’, and is fundamental to ensuring that the idea remains flexible enough to deal with any site. We separated the kit of parts into three differing scales – small, medium and large. Small might be a window or a door, medium might be an arrangement of spaces and large might be building scale. Simplicity in architecture is often harder to achieve than complexity. It requires restraint; the avoidance of solving problems by adding extras, favouring an integrated response. In aiming to design buildings which are simple to design, simple to construct and simple to use, then the design should inherently be simple. We saw this as a driving factor throughout the model; from building form and structure to heating, ventilation and maintenance. A reoccurring theme when liaising with teachers on the topic of schools as a workplace is operation and use of a teaching space. We often find that teachers like to be able to control their space, for example by opening a window when it gets hot. A naturally ventilated design with high levels of daylight is a design driver, fulfilling functional requirements, drastically cutting the cost of the M+E package, making it easier to run and maintain in the future. In collaboration with Max Fordham, we have established a set of design drivers, ensuring where possible all teaching space can be dual aspect, ‘clustered’ around a ‘hub space’ which can double-up as a break-out teaching space used to access the classrooms. This has the potential to maintain, or even increase, the amount of space which can be used for teaching, by pushing circulation space externally. Having a large proportion of circulation space externally allows for the government’s area reductions to be met, without sacrificing the size of any of the other school spaces. The team felt strongly that if it was to design out ‘M+E kit’ for reasons of capital cost, cost of servicing and ease of use, the remaining services would need to be easily serviceable, adaptable and accessible by any school caretaker. Furthermore as the method utilises a pavilion based model, each building will be more domestic in scale, with the potential to be heated by individual residential scale boilers which can be serviced without requiring a specialist. Where possible we minimise the number of walls which require servicing, thereby allowing for future proofing and for the easy adaption of spaces and arrangements to be achieved. This cluster known as a ‘pavilion’ is designed to be repeated as many times as is required for the size of a school. This approach allows a school to grow gradually, and be extended easily through the addition of another pavilion. A further building type partners these pavilions, and houses all the common school spaces, halls, kitchen, library, administration etc. Where possible this main building aims to follow the same rules as the pavilions, for example, positioning ‘inhabited spaces’ on the perimeter to ensure they can be naturally lit and ventilated. Designing a school as a series of pavilions, with a main building, is very flexible, especially when compared with government driven template designs. With the ability to accommodate a vast range of sites, planning constraints and the specific needs, requirements and pedagogical approaches of each individual school. As the project is not site-specific the structural solution is key to minimising the impact that different site conditions can have on the affordability of future schemes. At an early stage Price and Myers helped us to establish key structural design parameters with a target to reducing cost in the ground, construction programme and viability of projects on different ground conditions. A lightweight structural solution was favoured in order to avoid the likelihood of needing to have pile foundations. With such cost restrictions, any chance to reduce money put into the ground, in favour of using it elsewhiere on visible elements was vastly advantageous. The structural solution also provides some of the best opportunities to reduce the build programme – a key driver in reducing the build cost. Speedy construction, coupled with the need for the structure to be lightweight, is best facilitated with an off-site manufactured panel solution with openings for doors and windows already in place. Moving forward the aim is to develop the design to the extent that windows and doors can already be in place, maybe even the cladding. When you consider that a lot of these buildings are likely to be constructed on the site of fully working schools, a reduced period to erect the structure might also tie in better with holiday periods minimising disruption to the school. Using materials efficiently has been a key consideration within the methodology, from looking at the initial structural solutions, through to sizing the building envelope to best suit the structures capabilities. This thinking is also reflected through standard sizing of other building elements such as cladding and even plasterboard where possible with the aim of setting out gridlines which can drive the size of all building elements. This minimises unnecessary cutting and therefore wastage. Following the strategy employed by the government’s baseline design guidance we aimed to find solutions which could be tailored to cater for individual project requirements. This would create a set of baseline parameters which could be upgraded. The most obvious example is a buildings’ outer skin. As the concept does not rely on the cladding as structure, it can be freely interchanged with other materials to allow for differing tastes, planning requirements and site constraints to be met. Some of the other components which can be upgraded include windows, window reveals, roof, finishes, FF+E, landscape, lighting etc. Having developed the concept and the beginnings of a building form, we presented to members of the Galliford Try supply chain. Their input was crucial in furthering the development of the design, and in optimising the building to suit the different construction and component manufacturing processes. Over a number of weeks we met with them individually to discuss how, and what they could contribute to the delivery of the innovative solution; working with a large national contractor also provided them with a good incentive. This was a new experience for all concerned, one which was felt to embrace a refreshing and forward thinking approach. The majority of suppliers thought that they could respond to the challenge positively and we had great response, covering most aspects of the building, frame and foundations, windows, cladding, internal walls, ceilings. The key aim for the Optimum Schools concept is the desire to deliver buildings equal in design and construction quality as those built in the previous economic climate; taking on board the greater financial constraints and the reduced construction times. The design has therefore been developed following the key principles of simplicity, repetition, ease of operation and reduced lifetime running costs. Integrating the design team early on in the process has helped establish those key design drivers which have the greatest affect. 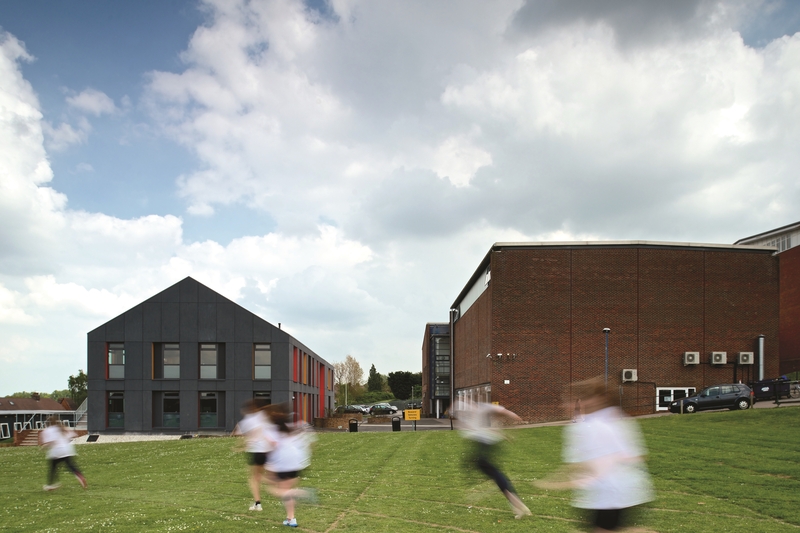 The structure is lightweight – spending less money on ground-works; classrooms are dual aspect maximising daylighting and opportunities for opening windows, reducing the reliance on complicated M+E systems which are susceptible to break-down. Involving the supply chain early on has allowed us to help tailor the solution to suit components instead of fighting against them. The fundamentals of building footprint and structural grid have helped to reduce wastage. The resulting benefits have allowed us to spend money on areas which have the greatest impact, the things you can see and things you can touch. The Optimum Schools concept has been well received by schools and local authorities alike, however having a physical example would turn a convincing idea into realistic possibility. The timings for the concept tied in with plans at Hillview School for Girls in Tonbridge which was looking into building a replacement for some 30 – 40 year old ‘temporary’ buildings. They had already investigated two other options, the first – a-like-for-like replacement of the mobile buildings, the second – a permanent new build option. However, neither had met their aspirations for a good quality well designed alternative. Whilst Hillview is a secondary school, Galliford Try saw this as a great opportunity to build their first Optimum School, a test version or ‘show home’ if you like. Although we had initially been developing the design for primary schools it was felt that this would further prove the flexibility of the ‘kit of parts’ concept. The building at Hillview School replaces existing science laboratories and business studies rooms. The building houses two science laboratories and one ‘super lab’, two classrooms and one ‘super classroom’ on two floors clustered around collaborative hub areas. The school was aiming not only to replace old and tired temporary buildings, but to use the new spaces as a vehicle to challenge and develop the schools’ pedagogical approach; they were exploring new ways of teaching science using the influence of Project Faraday, and how to adopt the ‘coaching’ technique in teaching business studies to large groups. Completed in early 2014, the scheme comprises a simple building form, clad with a high quality cladding panel, aluminium windows with brightly coloured window reveals which bring fun and energy to the building in a restrained manner. The internal spaces have been designed to echo the external colour palette. Feedback to the new building has been overwhelmingly positive, with one student suggesting that ‘the building smiles’. Teachers are delighted with the new and alternative teaching spaces which will allow them to develop more forward thinking methods of teaching. As a result of the efficient design and the use of modern methods of construction, the school was built in 21 weeks. This compares incredibly well to the 32 weeks it would have taken had it been traditionally constructed. The reduced time on site was key in reducing the construction cost and caused significantly less disruption to the on-going operation of the school. The overall cost was approximately £1.2 million equating to approximately £1,350 sq m. An incredibly positive result when compared to the £1,677 sq m secondary government funding allowance, particularly as the building had a number of ‘upgrades’ on what might be expected as standard. The Optimum School concept aimed to respond positively to the challenges set by a new incoming government, and following on from the concept and the subsequent completion of the first exemplary school, Galliford Try, in partnership with Scott Brownrigg’s Design Research Unit, has been recognised in the Education Investor Awards, winning the ‘School Builder of the Year’ category. In addition the innovative approach to the involvement of the supply chain has also been praised, with Galliford Try nominated for Supply Chain of the Year and Supply Chain Excellence of the Year by Constructing Excellence and Construction News respectively. To bring the story full circle, we started out by researching and interrogating what contributes to a good education, particularly prioritising the building and the affect it has on the teaching and learning environment. Since then we have contributed to the last two years of a special study unit, part of the PGCE Course at the University of Southampton. The sessions have looked to address key contributing factors to successful schools, the physical environment, resources and a positive ethos. The Unit aims to help future teachers grasp a better understanding of the design parameters of a classroom, and a school as a whole. It is hoped that by understanding the key issues they might be able to better utilise the space they are given to teach in and even become a more knowledgeable stakeholder, one that is capable of making the most of client engagement opportunities in the future.